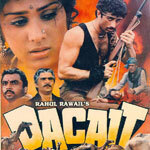 "Dacait" is a 1987 hindi film which has Sunny Deol, Meenakshi Seshadri, Rakhee, Raza Murad, Suresh Oberoi, Paresh Rawal, Urmila Matondkar, Anita Kanwar, A K Hangal, Shafi Inamdaar, Dan Dhanoa, Arun Verma, Ghanshyam, Harish Patel and Sunder in lead roles. We have 4 songs lyrics and 4 video songs of Dacait. R. D. Burman has composed its music. Shabbir Kumar, Lata Mangeshkar, Anand Bakshi, Asha Bhosle, Kishore Kumar and Suresh Wadkar have sung these songs while Anand Bakshi has penned its lyrics.